NEW YORK (AdAge.com) — It’s the ad served while you are reading the news in the morning on an e-reader that knows you’re at home and three blocks from a Starbucks. It’s a loyalty program on your phone that, through a hotel-room sensor, sets the lights and thermostat and turns the TV to CNN when you walk in the door. It’s finding a restaurant in a strange city on a Tuesday night, discovering that a store nearby stocks the TV you’re looking for, or that a certain grocery on the way home has the cut of meat you need.Forget Foursquare or Gowalla: Soon every website and service will be able to tell where you are, opening up the floodgates for location-based marketing and blurring the budget lines for advertisers. The potential of knowing when and where a consumer is — within privacy constraints, whenever those get hammered out — means thinking outside the interactive-advertising budget and dipping into other marketing disciplines’ coffers. “We’re talking about the buckets that were so nicely separated between advertising and promotions starting to fade,” Mr. Cassino said. Some of the money will be sourced from localised print media budgets (such as the Yellow Pages), newspaper classifieds and direct mail, as location helps people find businesses and coupons; some of it will come from interactive budgets as location will tie into the ways we access the internet in the future. Paul Feng, Google’s mobile-ads group product manager, said about one-third of mobile searches have local intent. To re-imagine search for phones, Google is evolving ad formats from just text and display; it recently let advertisers add phone numbers to mobile ads so consumers can click to call. Mr. Feng said to expect more new ad formats in the coming months that could potentially incorporate new types of interaction, such as navigation. Borrell, in fact, projects in its upcoming mobile report that location-based mobile spending will hit $4 billion in 2015, up from $34 million in 2009. Including ad spending with promotions, events and research, Borrell estimates mobile as a whole will dominate U.S. interactive marketing spending as soon as 2014 with 70% share, or $56 billion. While it’s difficult to imagine mobile advertising beating existing commitments to web development, banners and search, those commitments won’t be dedicated to PC browsers but increasingly to smartphones, Kindles, iPads, portable gaming devices and even cars. Outside of apps, there’s the mobile web, e-mail, text messaging and Bluetooth. Companies such as Placecast “geo-fence” retail locations and, once you opt in, blast FYIs or offers texts when you’re within a determined radius, blurring the lines between signage, couponing and mobile. In a four-month study with the American Eagle retail and Sonic restaurant chains, Placecast reported 79% of participating consumers said geo-fencing programs increased their likelihood to visit stores, and 65% made purchases during the program. 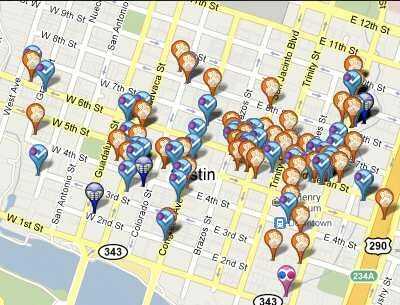 Right now, of course, given the hype machine at South by Southwest, the buzz is all about Foursquare and similar services, such as Gowalla. Its social appeal has not yet been emulated, though social giants such as Facebook and Twitter represent a threat. Today, one-quarter of Facebook’s 400 million users access the site through mobile devices; this set is twice as active than non-mobile users. Facebook is also expected to reveal a location-based feature in April, and Twitter released geo-tagging to developers late last year, which ties location to tweets. Facebook is an especially big contender in the mobile-location rush, with its existing scale and user base.